That is what we are demanding from the President and our elected leaders in Washington. Instead of building a wall that will cost countless millions, Donald Trump should invest that money in schools where all children--no matter their creed, color or citizenship status--deserve a high-quality neighborhood public school where they feel safe, respected and loved. 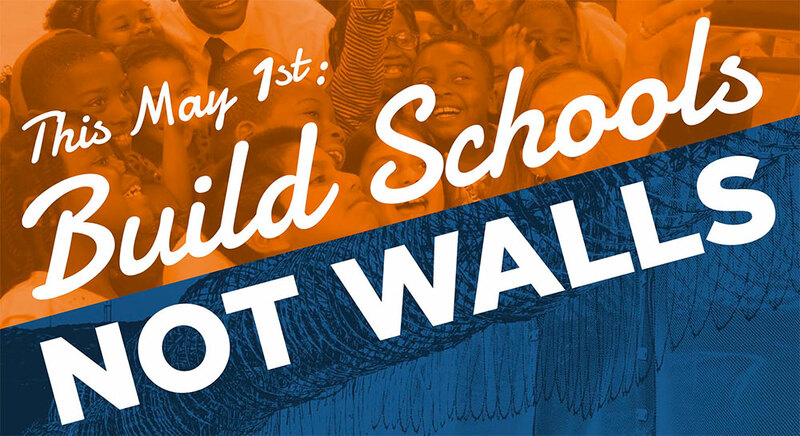 On May 1, we’re mobilizing with other allies—groups representing social justice, immigrant justice, civil rights, women’s rights and much more—to share our vision of a country where we invest in public education, we treasure the role immigrants play in our country and we work collectively to build schools, not walls. We’re asking all of you to join us on May 1st by reaching out to other organizations in your community to organize public action. Please watch reclaimourschools.org for updates and more information coming soon. 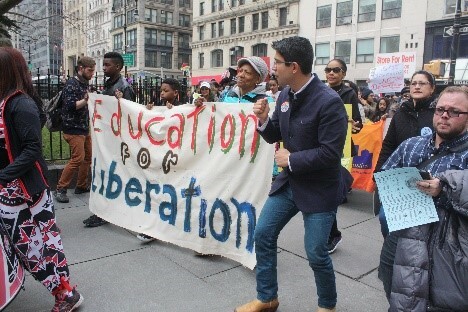 Members of New York City’s Coalition for Education Justice overflowed the steps of City Hall with parents, students, teachers and community members lifting up the importance of Culturally Responsive Education. They are demanding schools that have the training, curriculum and supports they need to give all children knowledge and pride in their culture and heritage, and create safe havens from racism, xenophobia, homophobia and all forms of bias. In depth, ongoing anti-bias training for teachers, administrators, and all school staff; and recruitment and retention of teachers and leaders of color. Culturally diverse curriculum that draws on students' personal experiences. Positive discipline practices such as restorative justice. Family, parent, and community engagement. Click here to read CEJ’s platform on culturally responsive schools. A bus tour, sponsored by Make the Road, CT and the Working Families Party visited the homes of some of the state’s wealthiest hedge-funders on Saturday as part of the groups’ call for closing the carried interest loophole in the state. The governor and state legislature are working to figure out how to close a $1.7 billion shortfall in the state’s budget this year. 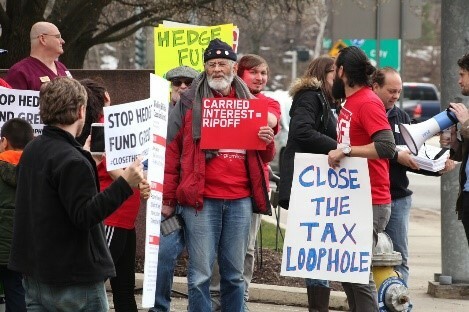 Activists with Make the Road, and WFP argue that closing the carried interest loophole could raise up to $500 million annually. Read more about the campaign here, including a link to a report by the Hedgeclippers campaign, identifying and calling out the super-rich who aren’t paying their fair share. 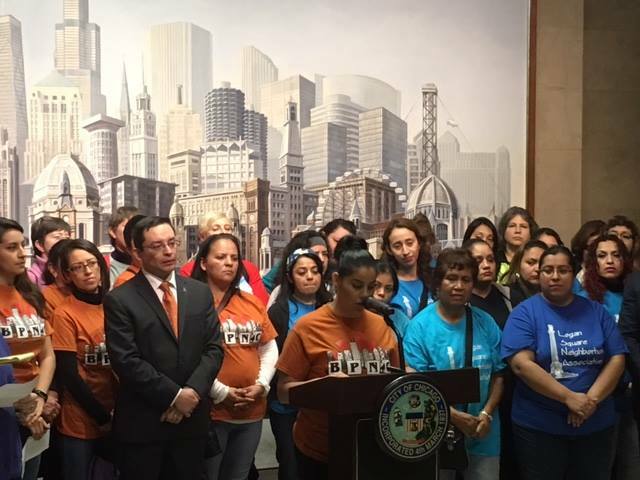 In other Chicago news, over 100 CPS parents went to City Hall to fight for their children on Wednesday. Ten organizations from across Chicago stood together to demand that CPS not close schools weeks ahead of schedule to save money. The groups are calling for redirecting money from subsidizing real estate developers to keep schools open and save summer programs. Groups participating included Journey for Justice, Brighton Park Neighborhood Council, Chicago Teachers Union, Kenwood Oakland Community Organization, Logan Square Neighborhood Association, Northside Action for Justice, Pilsen Alliance, Parents 4 Teachers, Raise Your Hand and United Working Families. Photo provided by BPNC. The Schott Foundation, along with Mississippi organizing group Southern Echo has released a new infographic on “what organizers need to know about ESSA. The infographic is a well-thought out and beautifully designed summary of what ESSA is, key parts of the new law and opportunities for organizing under it. .
Schools Shortchanged: Is your school getting the resources it needs to succeed? In a few weeks, look for a report from AROS on how public schools in low income communities and communities of color have been robbed of desperately needed resources. We live in the wealthiest country in the world. Why are our schools starving? Spoiler alert – the answer will make you angry!